The Russian Investigative Committee has reopened an inquiry into the murder of Neftyugansk Mayor Vladimir Petukhov in 1998, committee spokesman Vladimir Markin has said, adding that the latest information available suggests that the crime could have been ordered by former Yukos CEO Mikhail Khodorkovsky. "As part of this criminal inquiry, investigative measures are expected to be taken in order to expose persons involved in this crime and a number of other grave crimes. Witnesses and suspects will be interviewed. Khodorkovsky is most likely to be among them," Markin told Interfax on Tuesday. "I do not think that his absence from the territory of Russia will become an insurmountable obstacle to conducting all necessary investigative activities with him," he said. The investigation into Petukhov's killing in 1998 has been resumed "because new circumstances have been uncovered," he said. "The latest information available to the Investigative Committee suggests that this crime and a number of other grave crimes could have been ordered directly by [former] Yukos head Mikhail Khodorkovsky," Markin said. Neftyugansk Mayor Petukhov was murdered on his way to work on June 26, 1998. At that time, Yukos was the main employer in the city and the mayor allegedly had a conflict with the company over unpaid taxes to the local budget. The mayor demanded that a criminal investigation be launched against Yukos. Former head of the Yukos security department Alexei Pichugin was convicted of killing Petukhov. 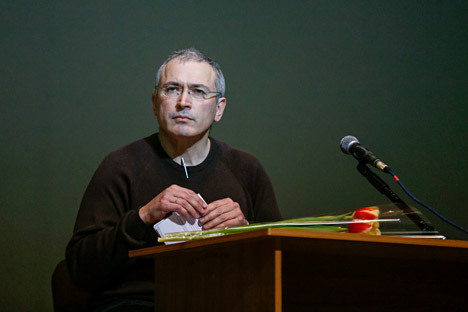 Information of the Russian Investigative Committee on the involvement of former YUKOS CEO Mikhail Khodorkovsky in the murder of Nefteyugansk Mayor Vladimir Petukhov is fiction, Khodorkovsky's defense said. "I do not comment on fantasies or on fiction," Khodorkovsky's lawyer Vadim Klyuvgant told Interfax on Tuesday without elaborating further. "This topic has been kicked about," he said. Khodorkovsky's defense has made repeated statements on his non-involvement in the 1998 Nefteyugansk mayor murder.